The gardener lives for fresh produce straight out of the garden, but the homesteader wants more. She wants to be eating her own vegetables straight through the winter and into the spring. But how? Last year, I got obsessed with freezing, and we did eat our own vegetables all winter long. 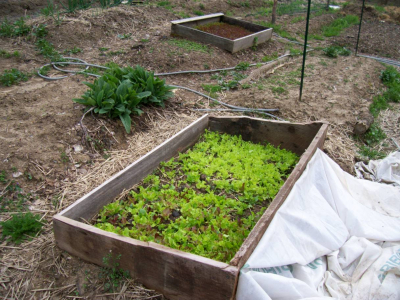 With some judicious use of cold frames, we even had fresh lettuce and greens for most of the winter to keep us healthy. But by late winter, I was still craving more fresh produce. The solution to the fresh-produce-in-winter problem is growing more vegetables that can be kept fresh straight through the winter. Why freeze those carrots and cabbage (like I did last year) when you could crunch into them fresh and crisp in February? This week's lunchtime series explores storage vegetables --- what to plant, how to harvest, and how to keep them fresh through the winter. I drew my information from personal experience and from Root Cellaring: Natural Cold Storage of Fruits and Vegetables by Mike and Nancy Bubel. I highly recommend the latter if you want more information.